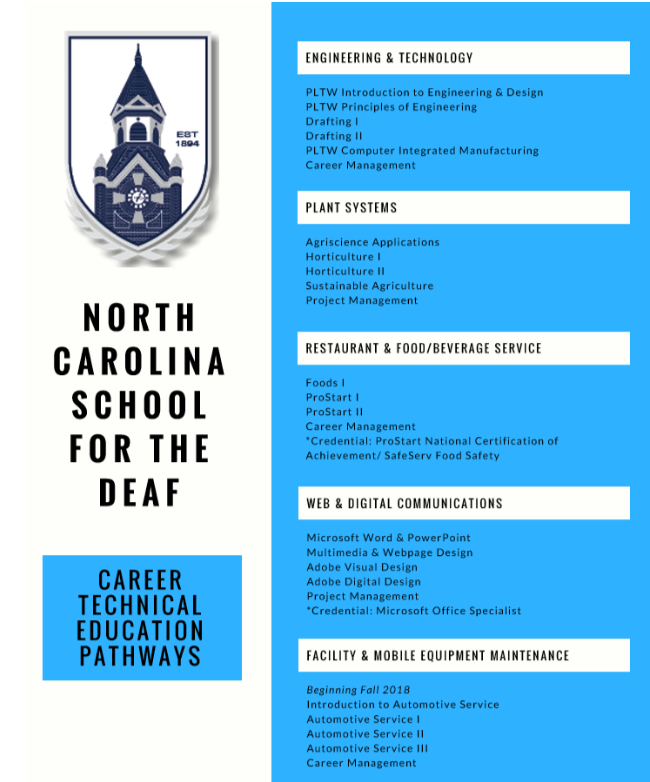 The CTE program at NCSD is designed to provide opportunities for students to acquire 21st century academic, technical, and workplace skills in a language rich environment, cultivating the potential in our students through rigorous classroom instruction and work based experiences. Our program prepares students for high demand, high-wage jobs in a dynamic economy. NCSD staff is committed to excellence throughout academic programs. CTE courses are aligned with the Career Cluster and Pathways framework from the Department of Public Instruction. Courses are taught by teachers certified in CTE, Deaf Education, and with experience in their pathway. Five career major pathways are offered: Engineering & Technology, Plant Systems, Restaurant & Food/Beverage Service, Web & Digital Communications, Facility & Mobile Equipment Maintenance.